We'll be asking for your help on a number of closing issues, but this post is focused on how we can improve "Off-Topic" closures. Is this even necessary? What's actually not working today? To be clear, closing questions as Off-Topic, exactly as implemented today, is doing a hell of a lot of good. Big picture, it's a huge success, and one of the key things separating us from Whoopie! Responses. We can do a much better job helping posters to understand why their question is off-topic. Consider a question like this one, from our programmers site: How do I review my own code?. Now, to be fair, this particular question wasn't asked on SO first, but we've all seen ones like it asked there. Questions on Stack Overflow are expected to relate to programming or software development within the scope defined in the FAQ. Hmm... how is a question about code review not related to programming or software development? The message doesn't just fail to make the user understand their mistake, it actually makes them more frustrated, as it reinforces their perception that it meets the criteria. But wait a second. Is it really so unreasonable to expect them to ignore or get over that conflict, and go read the FAQ - there’s a link right there? That's a question for another day, but let’s say they actually do that. It’s still hard. The first thing you see on the FAQ is the list of questions that you should ask here. Guess what’s on it? if your question generally covers …practical, answerable problems that are unique to the programming profession… then you’re in the right place to ask your question! “How do I review my own code” still seems to meet the criteria. And if you soldier on, you'll find the two additional relevant sections in the FAQ (that are initially hidden) which you might think would help - one is on what NOT to ask, and another is on question types that probably belong on another site, but neither of them actually eliminate this question. So, imagine you’re this user. You post a question that sure seems to be about programming, but it’s closed because this site only accepts questions that “relate to programming or software development.” You get over this seeming inconsistency, go to the FAQ, where you find another indication that your question belongs here, and no indications that it doesn’t. Now, we can improve the FAQ to cover this, and we are planning a number of FAQ enhancements, but that’s more like treating the symptom than designing a cure, and it's dependent on getting them to go somewhere new to learn more about what they did wrong. Without lowering our standards, how can we make the system convey what specifically made a closed question off-topic, with as little navigation as possible? If we can answer that, people still may not like having their questions closed, but they'll be less likely to incorrectly assume they're "just being picked on" or make the same mistake again, and some may even be able to edit their question to fix the problem. Each site needs their own reasons for closing questions as "off topic". The main problem is that each community has different reasons for closing questions as "off topic" (if they aren't otherwise not constructive, too localized, or not a real question). However, from all those reasons, the most obvious should already be in the FAQ, and well known to most members. It's just a matter of finding out which ones are good candidates for boilerplate close reasons. This could be done, for example, by polling on Meta, or through discussions amongst the moderators and the community team. Once a number of predefined "off topic" close reasons has been chosen, anyone voting to close as off topic may now use these reasons for clarifying their vote. This is much like the rejection feature for suggested edits, where the most common problems with edits have been made bullet points (e.g., invalid attempts to reply, vandalism, …). The suggested edit rejection dialog also works very well for tag wiki edits, where different reasons are used (tag wiki not helpful, …). If any of the predefined options doesn't fit, the user can add their own custom reason for closing the question. If there had been a custom close message, this would be displayed in the same list. Of course, the messages in my examples could be refined and definitely have to be chosen with caution so as not to change the scope. We wouldn't want to offer users new reasons to close questions that would otherwise be fine to stay on the site. The benefit of using boilerplate reasons is that closing can still be kept efficient (think about sites with lots of traffic), and at the same time as verbose as it needs to be, since custom messages can appear in the list below the question. The list can (should?) of course be kept anonymous, include counters that indicate how often a sub-reason was chosen, et cetera. There should be a second, more detailed level of close reasons beneath each main reason (OT, NaRQ, Not Constructive, etc.) this second level should be curated by the community, separately for each site. What happened to this question? Your question was closed. 5 members of the community thought it is not a good fit for Stack Overflow in its current form. A closed question can no longer be answered, but it is not deleted. You can edit your question to improve it. If you edit your question, it will be automatically nominated for reopening. Why was the question closed? If you feel your question was closed in error, you can flag for moderator attention or ask for support on Meta Stack Overflow. This is frustrating. Why aren't questions just left alone? A closing does not necessarily mean your question is bad, and it should never be taken personally. Stack Overflow has a very narrow scope, a high standard of quality, and expects questions to be very specific. We know dealing with this can be frustrating at first - but it's worth it! We believe this strictness is part of the site's success, and makes it a more useful resource for all. 5 community users think your question was asking for a shopping or buying recommendation. There is nothing wrong with such questions, but they are not on topic on Stack Overflow. Experience has shown that they tend to attract low quality content over time, and create other issues. You can read more about the topic here. You can edit your question and try to make it more specific. Add details about your requirements and your specific situtaion. In short, try to turn your question it into something more substantial than just "what is the best xyz?" If you are looking for a market overview for a certain type of product, consider searching Wikipedia which has lists for many categories. Well the obvious "leave a comment" solution simply isn't sustainable, and from a system perspective it's a cop-out, not a solution (just let the users do it!). Off Topic is unfortunately really something that's defined by the site. Career Advice is Off Topic on Programmers, even if the career is Programming; there's no generic close reason that could ever hope to convey that. What I think could work are Custom, mod-editable sub-close reasons for each site. Instead of "Off topic, see the FAQ" you might see "Off Topic: Questions on career advice are considered blah blah blah". Possibly with a direct link to a relevant section of the FAQ or Meta post. I'd imagine the sub close reasons could just be a list in the Close box after you click "Off Topic", sort of like the question list after clicking duplicate. You'd get the option for all custom close reasons, plus the generic one. The generic close reason should probably be kept in addition for when posts are just blatantly off topic as well; sometimes "questions should generally be about X" really does cut it when someone asks how to work their graphics card on User Experience (it's happened). For general awareness mods should probably post a Meta thread about a possible new sub-close reason, sort of like we do in the FAQ, to introduce them to long-time users who don't have the new close reason. As already mentioned, to make the off-topic close reasons easily understandable without requiring users to dive into the FAQ will require customized close reasons for each site. We still need one generic off-topic close reason, for all those cases where users ask some blatantly off-topic questions, but the problematic parts are those off-topic cases that are not obvious just from the site name. But we have to limit ourselves to the most important close reasons, those that are not obvious and that happen frequently. We can't and should not cover every corner case, or the close reason list will get too long. The close reasons should be either mod-editable, with the understanding that only the major cases get their own close reason, or the suggestions should have to be approved by SE. I think allowing mods to edit them should work, if we make sure the mods are informed on when another close reason should be added. As already suggested by SE staff and some users here, the best fit would be an off-topic sub-reason, this would prevent the inital close reason list to become too intimidating. The close reasons could also contain links to relevant meta posts for more background about this specific aspect of the site scope, but they should also be able to stand on their own. Provide us with the tools to create specific off topic messages. Allow each community to use their meta to work out what the messages should be and let the site moderators to manage them. I guess that's the easy bit, deciding which message to use could be trickier possibly just extend the voting to it with a simple majority or mod trump winning. 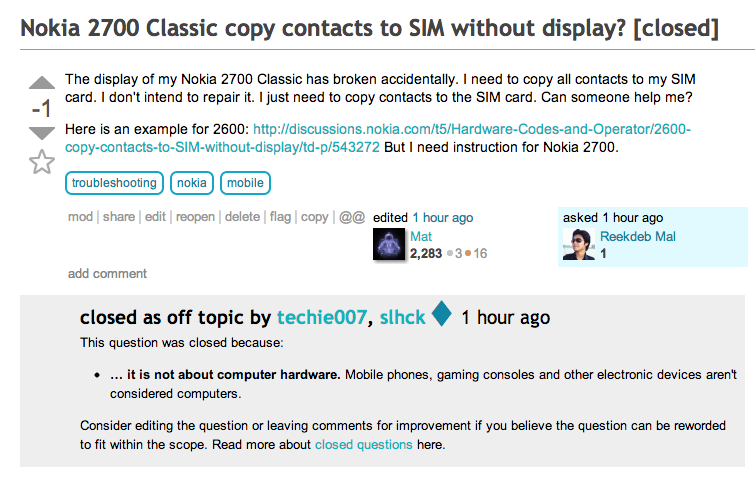 When applicable, the off topic message should link to the StackExchange site where it is on topic. Personally, I've been hit by the NARQ and OT responses enough times that, for now, I'm done asking questions on SO or anywhere else on the StackExchange sites (motto: "Your problem is not my problem" -- and I don't really mean that; I'm just really frustrated). Why? Because the OT and NARQ responses are un-helpful. To me, help means providing guidance, not just information--as in a direction in which to head. The canned responses are useful, but not helpful. Even with the milder language that advises how to write questions gooder. (/s) Some questions are just not "right" for the site in which it is posed, no matter how it is phrased. The canned responses explain themselves very well; they just don't help me know where I should have posed my question. To be clear: I'm very glad that SE tries very hard to keep the sites useful. I agree with the notion of closing responses as OT or NARQ. By the way: before you ask, I have tried to Bingle my questions to see on which SE sites my kinds of questions show up on. 99.9% of the time, it's SO. But 80% of those times, those questions are closed as OT or NARQ. So much for THAT idea! My recommendation is that before a question is closed as OT or NARQ, the person closing it should guide the poster towards one or three sites that might help. Yes, I'm aware that you don't want to make site-specific references because each site has their own narrow definition of what is on topic and what constitutes a real question. Are you aware that your denial of the existence of other sites is a little off-putting? Nevertheless, I'm very sure that people who vote to close questions as OT or NARQ have some idea of where such a question might be better served. I feel pretty certain that most OT or NARQ questions asked on SO can probably be directed towards only a handful of other SE sites (like programmers, or serverfault, etc.) or, heaven forbid! some other sites on the Internet that might actually provide answers to question like "Would you please recommend some books on X?". The list of other recommended alternate sites might be tied to the reasoning for the OT or NARQ closure, or maybe just a link to a page that shows common OT or NARQ question types and the recommendations that accompany each type. Not the answer you're looking for? Browse other questions tagged discussion closed-questions close-reasons off-topic . Why is only 1 reason displayed on closed questions when different reason votes were cast for it? Is downvote piling really necessary? Shouldn't “off-topic” be only about… off-topic?